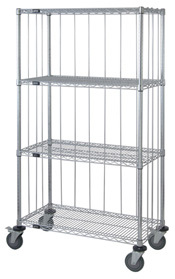 Metal wire shelving units are made for industrial, office, retail, or food service organizations. They are versatile, tough, and easy to assemble without tools. They can be used in any type of environment because of their amazing adjustability that allows all kinds of items to be stored on them. Perhaps the greatest benefit they offer the ability of a business in crowded quarters to transform much of its unused vertical cube and empty floor space into super efficient storage space. This newly organized utility space now becomes an inventory control area that is safer, more accessible, more consolidated, and far less frustrating for employees to work with. There are many other advantages of a metal wire shelving systems. • Units mounted on casters are mobile. • Metal wire is easy to clean. • Metal wire is shiny and aesthetically pleasing. • Metal wire can handles chemical storage, food storage, and wet storage. • Metal wire is every bit as adjustable as solid shelving. • Metal wire can be configured in all sorts of ways. • Metal wire can be mounted in many different ways. • Metal wire can transform both walls and corners in to storage areas. 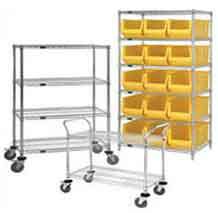 Metal wire shelving systems are used in a very wide range of business types and applications. • Restaurants, clinics, and hospitals simply cannot do without them. • Wire units are perfect for storing storage of computer parts. • Offices use wire shelf units to organize office supplies and consolidate paperwork. • Mobile wire units are needed wherever objects have to be transported from one place to another. Many people find it hard to believe that metal wire shelving systems are so vital to the restaurant industry. When you think about it, however, it makes perfect sense. The back of a restaurant is often busier than the docking area behind a warehouse. Supplies are constantly coming in on trucks to replenish food products that have been prepared and served. These supplies must be carefully categorized and appropriately stored. Some may need to go into cold storage, which wire shelves are ideally suited for. Others require dry storage and immediate accessibility. Cookware and utensils often have to be stored, sometimes in special bins. All of these activities are applications that metal wire shelves are ideally suited to. The most important thing to always remember anytime you go online to look for metal wire shelving is to know which mounting options will bring you the best conversion of vertical and horizontal space. To determine this, just ask yourself the following questions. • Is my storage area a relatively small space where individual shelves can mount directly to the wall and provide a place to store items within arm’s reach? • Do I have a high ceiling or a low ceiling? • Can my entire storage room be turned into a stock room by standing shelving units along the back wall and along the sides? • Will I need to transport the items I store? Getting the answers to these questions will narrow down your options until you find the one that best serves your business model.